Photo 3: Attendees expressing their views with a card vote. (1) As community mediator, I briefed attendees on the importance of the symposium and reviewed the three-and-a-half years that had transpired since the nuclear plant disaster together with trends in the views and feelings of Fukushima’s citizens through that period. I then stressed two points relevant to the main theme of the symposium: namely, that the symposium does not reject the idea of undergoing thyroid screenings (in fact, it recommends them) and that the symposium does not deny people the right to have questions about the screenings (in fact, it values frank questions). As reasons why the voice of Fukushima’s citizens had not been heard, I cited the realities at the end of March 2011, when many families desired to have at least their children evacuated to safety after the nuclear accident but the only response to their appeals was the reopening of schools. I asked whether it was not at that point that citizens had begun to feel frustrated by or resigned to the idea that their voices were not being heard. Next, Dr. Urashima gave a detailed presentation on thyroid screenings and thyroid cancer, including the point that thyroid cancer differs from other, more common cancers in that it does not require that one hastily undergo surgery. Additionally, utilizing Fukushima Medical University data, he presented a chart that illustrated a sharp downtrend in the number of patients who had undergone surgical procedures to remove cancer over the three years following the nuclear accident. Should the citizens of Fukushima Prefecture not be shown how to interpret such data? Dr. Thomas discussed differences distinguishing the Chernobyl and Fukushima Daiichi nuclear plant disasters and presented evidence that cases of thyroid cancer detected thus far in Fukushima were not caused by exposure to radiation but had conceivably developed prior to the accident. 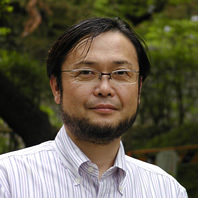 The couple from Ryozen-machi noted that even though they had studied at science-oriented universities they still experienced difficulty in understanding the information on thyroid cancer, unlike external radiation exposure from contaminated soil, etc., and internal exposure from contaminated foods. They also cited the example of another couple in their neighborhood that had proactively sought to avoid the risks of radiation exposure following the nuclear accident but who had tested A2 in thyroid screenings and thus sent their children away to another prefecture to protect them from exposure. The panelist couple also found fault with a lack of access to information that would allow them to make informed decisions. Dr. Ochi pointed out that qualitative and quantitative differences in available data can lead to differences in public awareness about thyroid screenings and their results and cited examples of even medical professionals committing mistakes for that same reason. (2) Following the presentation of views by the panelists, I proposed that the approx. 30 attendees assembled on the floor spend five minutes exchanging views with those sitting around them. This immediately sparked a burst of activity in the room, demonstrating that everyone had an opinion. Everyone was handed a set of blue and red cards, which they used to readily express their views in response to questions posed by the panelists. This approach was chosen to allow attendees to see the results for themselves. Photo 4: Symposium attendees engaged in dialogue. Question 1: Thyroid screenings are divided into preliminary studies and complete studies. Preliminary studies are considered to provide a baseline for investigations into whether an increase in the incidence of thyroid cancer has occurred in the complete studies. Can you accept this explanation? Roughly half of the respondents in the audience did not understand the question. 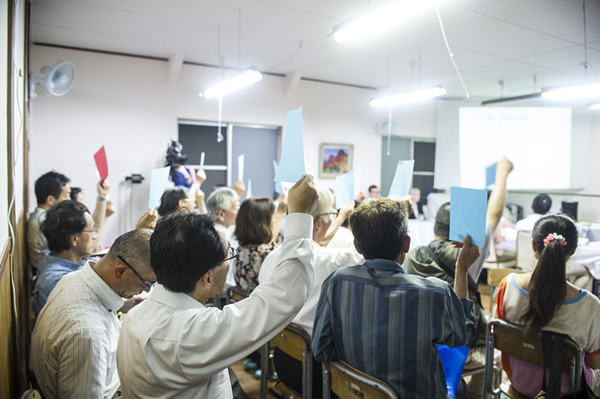 All raised a blue card (“yes”) when asked whether this was the first time they had heard of the Fukushima Medical University explanation that preliminary studies are utilized to obtain a baseline. Question 2: Do you feel that the importance of this screening procedure is limited solely to preventing deaths from thyroid cancer? Or, do you feel that screenings also should be utilized to scientifically determine whether the effects of nuclear accidents lead to an increase in the incidence of thyroid cancer? The respondents in the audience did not understand baselines. Accordingly, a majority supported the view that citizens in areas outside Fukushima Prefecture also undergo thyroid screenings. Improvised comparisons with target control groups will provide an easy-to-understand basis for the question of whether cases of thyroid cancer detected through screenings to date are related to the nuclear accident. The frank feeling expressed by the attendees was that they wanted to see citizens outside the prefecture screened as well and thus contribute to health surveys in Fukushima and provide data that forms a better basis for decisions. When queried as to whether this should be one of the conclusions of the symposium, one female attendee conceded that it would be wrong to have citizens in other prefectures endure the same hardships. 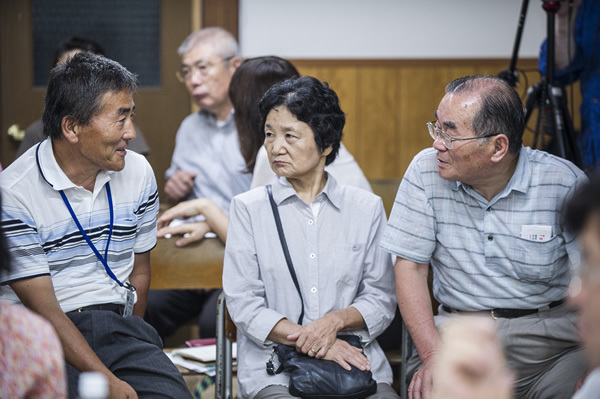 Although her comment drew strong applause from all of the other attendees in the room, a majority still felt strongly that citizens outside Fukushima Prefecture should also be subject to baseline studies. Another view from the floor was that baseline studies need not involve complete-count screenings. Question 3: Prior to undergoing a thyroid ultrasound examination, do you feel that an explanation of its potentially detrimental effects is also needed? This question elicited the first unanimous vote from the floor, with all in attendance raising their blue cards. Strong support was also expressed for the view that the question deserved more study along with the issue of excessive medical procedures. We deemed the two quotes cited above to represent the conclusions of the symposium. At that point, a member of the audience on the floor followed with a comment that effectively summed up the accomplishments of the event, including remarks that called on specialists to do something about explanations based on terminology that was extremely difficult to comprehend. This was welcomed by the floor with applause. These remarks prompted Prof. Thomas to express regrets on behalf of all of the specialists for an inability to discuss the familiar issues of health in simple layperson terms. She then pledged to convey the conclusions of the symposium to Fukushima Medical University personnel on her scheduled visit to that institution the following day. However, when I noted that the Radiation Medical Science Center for the Fukushima Health Management Survey offers a traveling seminar on thyroid screenings as a tool for study groups on thyroid screenings and thyroid cancer, none of the attendees or panelists had heard of its existence. Because the symposium was held in a location that afforded relatively poor transportation access, it actually appears to have attracted attendees who had devoted serious thought to the issue of thyroid cancer, wanted a forum through which to articulate their views, and wanted to convey the views of their community. The event had the participation of journalists from two major national newspapers (the Asahi Shimbun and Mainichi Shimbun), two regional newspapers (the Fukushima Minyu Shimbun and Fukushima Minpo News), one television station (NHK Fukushima), and also had one independent journalist and media representative in attendance. Coverage of scenes at the symposium was aired on local news programs at noon the following day and succeeded in disseminating information about the symposium to many of the prefecture’s citizens. Moreover, unlike many other symposium events that had been characterized by one-sided presentations from panelists or jeering from the audience, the atmosphere at our symposium fostered lively participation in the discussions by everyone in attendance. It is worth noting that in addition to exchange between the floor and the panelists, the time devoted to exchange between attendees on the floor themselves was time well spent. This approach yielded meaningful dialogue. It attested that attendees were able to comprehend the explanations and commentary tendered by the panelists, based on which attendees discussed the actions they should pursue. That was arguably the single most important accomplishment of this symposium. It is likely that a series of symposiums on this compact, down-to-earth scale and held in familiar local settings would help to empower the citizens of Fukushima Prefecture at large. In bringing this symposium to life, we are thankful for the tremendous cooperation and support we received from the children of Ryozen Drum Troop, the Satoyama Choir, and Mr. and Mrs. Takano of the Ryozen Satoyama School. You have my sincere gratitude.